Another day, another tease from Marvel about a completely insane redo of a classic comic storyarc. This time it's Iron Man's '80s mega-event Armor Wars, and holy god that's a giant Iron Man clearly designed to fight off Galactus shooting the face out of the Statue of Liberty. There's no need to repeat the speculation about what Marvel's planning for 2015 — you can read my previous thoughts here — but some have suggested that all of these redos are part of the new Secret Wars event, which features Marvel heroes fighting different versions of themselves. 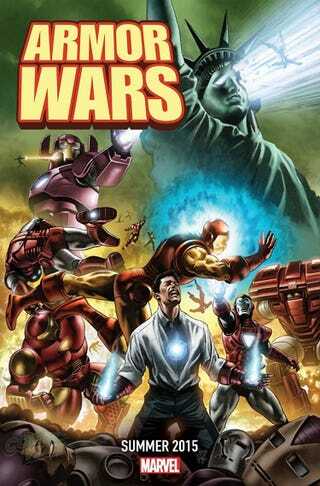 Certainly Armor Wars here and the Planet Hulk promos fit in that, but that Civil War promo doesn't look like a battle between realities as much as a straight-up do-over of the story. I'm sure we'll find out what the deal is eventually, but for now Marvel is welcome to release as many of these insane promotional pictures as they want. I vote for the Onslaught Saga next, except this time Onslaught is actually Stan Lee.